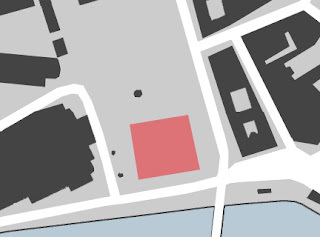 Within the expansive jumble of modern Stockholm, it is hard to appreciate the density of palaces that was built in the 1600’s. 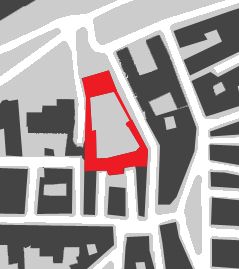 But considering that the population of the city was only 15,000 people in 1635, the 22 palaces built during the 1600’s represents a significant proportion of the land area that was developed during this period. The 17th century is called Sweden’s Stormaktstid, or Sweden’s Time of Great Power. It was during the 1600’s that Sweden reached its greatest size, encompassing all or parts of Norway, Denmark, Germany, Finland, Estonia, Russia, Latvia, Lithuania, and Poland. 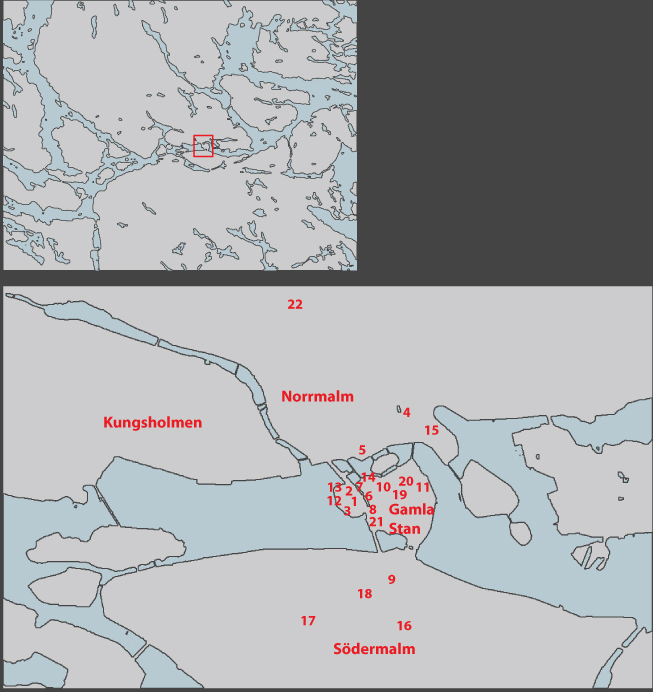 Due to these successful territorial campaigns, prosperity reined in Sweden. Stockholm became an important center of trade for Northern Europe, and the city filled with foreign money, merchants, and goods. This prosperity caused a period of extraordinary growth and expansion in Stockholm in the mid-1600’s. The population quadrupled within 50 years, a growth rate that has never been replicated in Stockholm. I have previously outlined how the city’s expansion was organized by Örnehufvud and how new churches were built to accommodate the growing population, and in this post, I will highlight how palaces were gushing forth at an unprecedented rate throughout Stockholm in the 17th century. An equally impressive number of summer palaces were built just outside the city as well, but this post will focus on the city palaces only. Conditions were right for the explosion of palaces that occurred throughout the 17th century: the nobility and merchants had the capitol to hire famous architects and to build sumptuous homes for themselves, and they now had the blessing of the crown to do so. The palaces from earlier in the century were styled in various interpretations of the Dutch Renaissance, but later palaces were designed in a simpler classical, Palladian vein. All but one of the Dutch Renaissance palaces were later renovated to this more “modern,” simplified classicism. 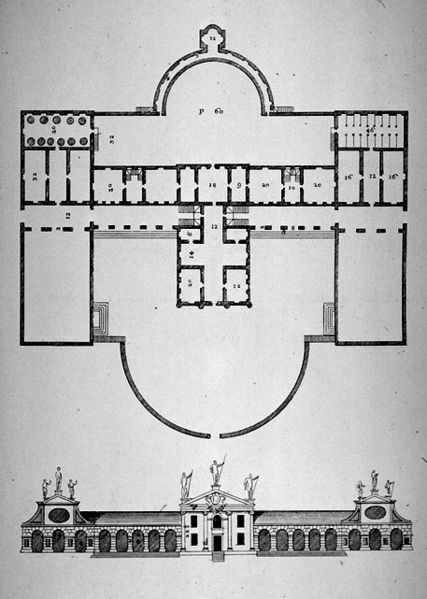 When scrolling through the plans and original drawings of the palaces, it becomes obvious that Palladio’s tripartite villa plan with a head building flanked by two auxiliary wings became the height of fashion. The Palladian style was extremely fashionable at the time, anyway, but I believe that the tri-partite scheme was so popularly adopted due to the king’s new allowance of large gardens inside the city walls. 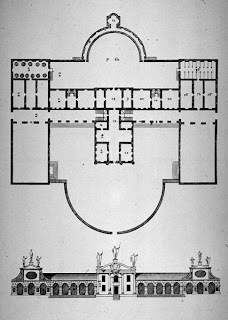 Palladio's Villa Barbaro is a classic example of the Palladio's famous tripartite plan: a main building flanked by two wings. With the discovery of the New World and with Europe’s push into Africa, new exotic plant species were continually brought back to Northern Europe. Owning some of these plants was a sure sign of wealth and success, but to cultivate them oneself (or to have one’s servants cultivate them) was yet more impressive. Enclosing a garden with stone walls yielded a protected and slightly warmer micro-climate, allowing some plant species to grow where they seem most unlikely. Coupling the stone walls and warmer micro-climates with orangeries or greenhouses allowed the wealthy to even cultivate exotic fruits such as oranges and lemons. Taxes on these gardens were not monetary; instead, one was required to share the resulting fruits, vegetables, and herbs with the crown. There were not enough local architects to meet demand, so architects were “imported” from the European mainland. Two of the most important of these imported architects were the Frenchman Simon de la Vallée and the German Nicodemus Tessin the Elder in the 1630’s. Together, they brought a more continental, less medieval style of architecture, and they founded architectural dynasties in Stockholm. Both of their sons, Nicodemus Tessin the Younger and Jean de la Vallée, continued the practice of Palladian architecture after their fathers’ deaths, but the sons’ Palladianism was noticeably more restrained. Even Jean de la Vallée’s son-in-law, Mathias Spihler, continued the Vallée family’s architecture business for a third generation. Of the 22 palaces outlined below, six were designed by unknown architects, twelve were designed by the Tessin and Vallée dynasties, and four were designed by other, lesser-known architects. 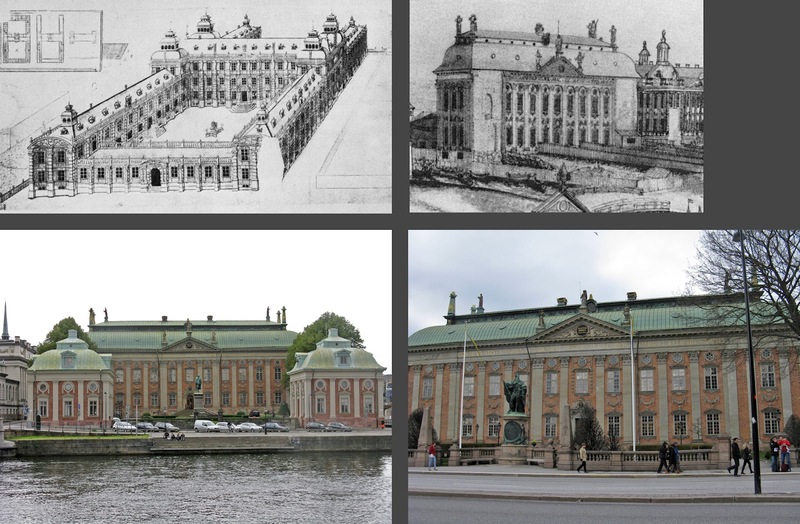 The fact that 12 of 22 of the palaces from the 1600’s were designed by the Tessin and Vallée families shows how dominant these families were in Stockholm’s architectural scene. Other architects certainly participated in the palace-building craze, but they seem to have mostly been imported by foreign merchants to design their one palace. It seems that generally, these lesser-well-known architects went back to their home countries after the palaces were completed. Perhaps the most remarkable thing about Stockholm’s palaces from the 1600’s is how many remain today. Of the 22 palaces, only one no longer stands. Makalös Palace burned to the ground in 1825. Below I have included maps, images, original drawings when possible, and a short commentary for each palace. 1) Hessensteinska Palace or Bengt Oxenstiernas Palace, 1628. Riddarholmen. Architect unknown. Built by a Privy Council member who was also a diplomat. Note how this building was later renovated to a simpler, more restrained classicism. Even though the original detailing was more Dutch Baroque in style, the tripartite plan with wings clearly recalls Palladio. 2) Stenbocks Palace, 1630. Riddarholmen. Architect unknown. Built by a Count who was also the president of the Court of Appeals and a member of the Privy Council. This palace was also originally Baroque, but I have not found a drawing showing what it originally looked like. While we do not know who the original architect was, we do know that the 1670 renovation was by Nicodemus Tessin the Elder. 3) Sparreska Palace, 1635. Riddarholmen. Architect: Nicholas Tessin the Elder. Built by a Privy Council member. I have not found images of what this palace originally looked like, but I have read that the current facades were simplified from a late Renaissance style to be quite plain with smooth, plastered white surfaces. Like most of the other palaces on the island, Sparreska's waterside location yields confusion as to which is the front and which is the back side. 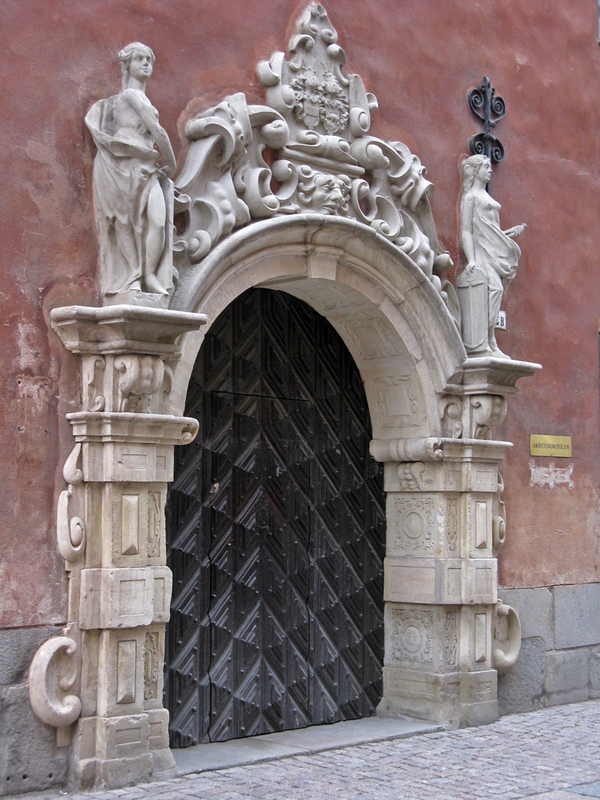 Today, the church square side of the building is used as the main entry, but I believe that the main entry in the 1600's faced the water because a) an original ornate sandstone door portal faces the water and b) drawings of nearby palaces clearly indicate that they were oriented toward the water and not toward the interior of the island. 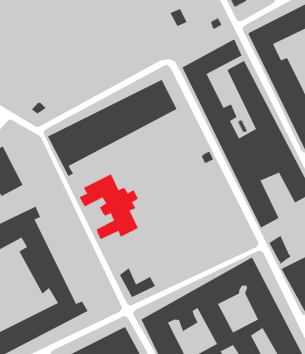 I do not know for sure if this building originally had wing walls and a garden of some sort, but today, a tripartite scheme is evident. The main, middle mass is a story taller than the two side masses. Additionally, on the water side, the middle mass projects about two feet beyond the two side masses. It is unusual that the middle mass is the projecting mass, usually the wings project forward. 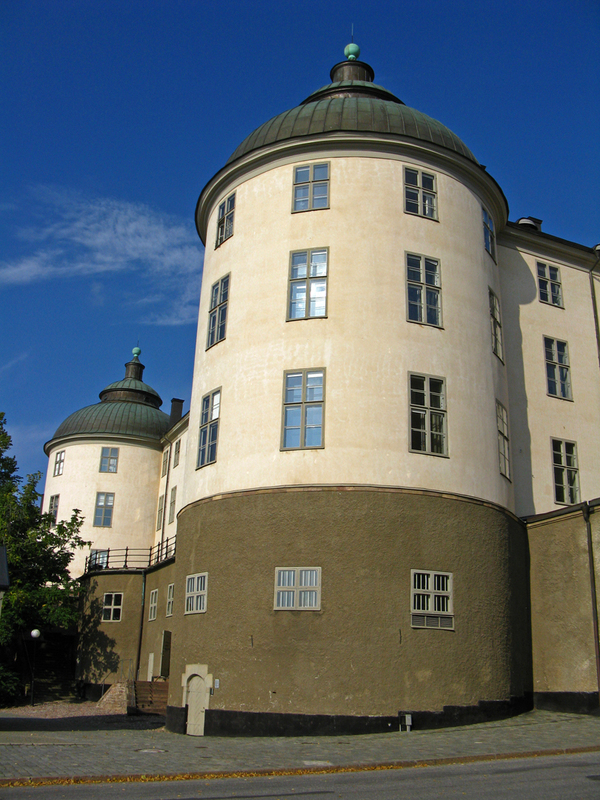 4) Makalös Palace, 1635-42. Norrmalm. Architect: Hans Jacob Kristler from Strassbourg. Built by an Earl. Burned. It is extremely sad that this building burned in 1825, because nothing in Sweden was in league with this palace in size or scrumptiousness. Like most other palaces from the early 1600's, this one has a distinct Dutch Renaissance flair. However, the corner towers and inset central mass show that Palladio was a form-making influence even if the decorative qualities did not match Palladio's style. 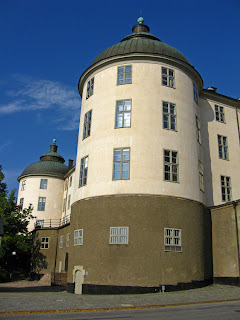 5) Torstensonska Palace, 1640’s. Norrmalm. Architect unknown. Built by a Count who was also a Field Marshal. The original facades featured Dutch gables, but the building was largely renovated to French Classicism in the 1790's by Erik Palmstedt. The uppermost image shows the building as originally built. The lower left image shows that the side facade still retains the character of the original building while the lower right image shows that the facades facing Gustav Aldof's square and the water were renovated to a formal Classicism. The "new" Classical details, the awkward transition from renovated to original facades, and one of the original Renaissance portals on the un-renovated facade. 6) Ryningska Palace, 1640. Gamla Stan. Architect: Simon de la Vallée. Built by a Baron who was also an Admiral. Much of the original Dutch Renaissance character has disappeared with the exception of the corner quoins and an original sandstone portal. Like many palaces, the high roof became outdated and a new, lower roof with dormer windows replaced the high roof and Dutch gables. I am amused by this odd perspective from the 1600's. You can see too many sides at one time! 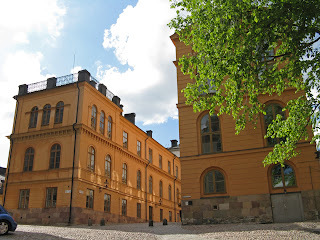 7) Riddarhuset or The House of the Nobility, 1642. Gamla Stan. Simon de la Vallée. Collectively built by the nobility as a meeting place. The upper left image shows Vallée's original ambitious plan for the building. It was to have side-wings extending from both the front and the back of the head building. None of the wings were built, as is seen in the upper right image. However, two wing-like but detached buildings were built on the water side of the building in the 1800's (lower left). 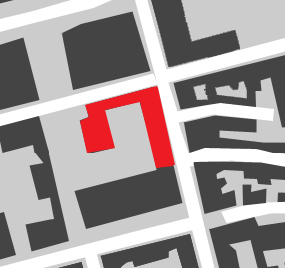 One the lower right, one can see that the building is virtually unchanged from its original construction. While Simon de la Vallée was responsible for the original design, he died before the building was completed. Heinrich Wilhelm, Jost Vingboons, and Jean de la Vallée played later roles as construction continued. 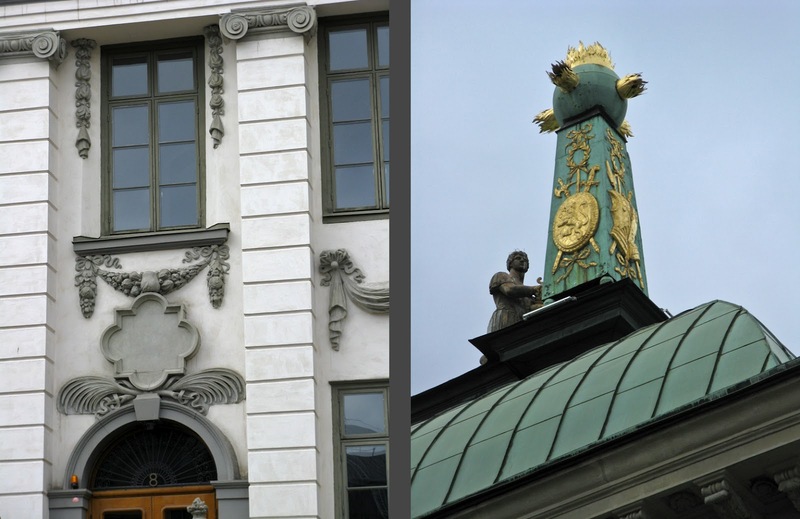 Riddarhuset's detailing is gorgeous. Interestingly, this is the only palace that is not plastered and which reveals the underlying construction material, which was most commonly brick. 8) The Petersenska House, 1645. Gamla Stan. 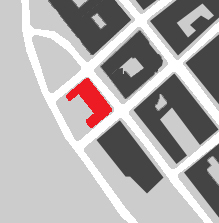 Architect: Christian Julius Döteber from Lubeck. Built by the governor of the Royal Palace. This is the only palace from this period to have retained its original Dutch gables. With time, the building was expanded to its current double enclosed courtyard plan, but the drawing above to the left shows that the house originally had walls extending from the main building to enclose a garden. 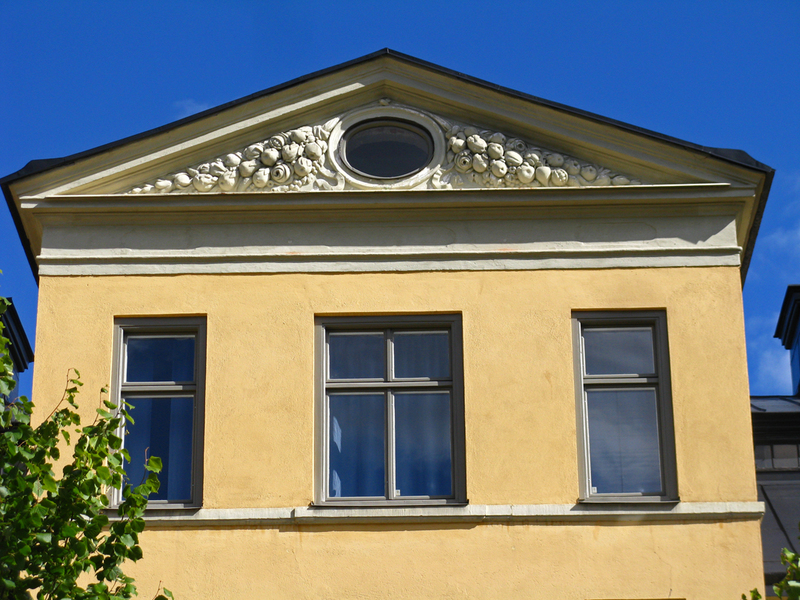 Like the Hessensteinska and the Makalös Palaces, this building demonstrates that Palladio's formal influence was felt in Stockholm before his stylistic influence. 9) Louis de Geers Palace, 1645. Södermalm. Architect: Jürgen Gesewitz from Germany. Built by an industrialist. 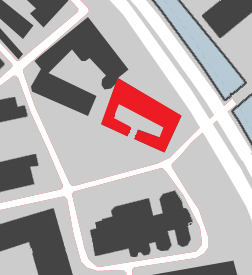 The orientation of this U-shaped plan is unlike the tripartite Palladian U-plans. 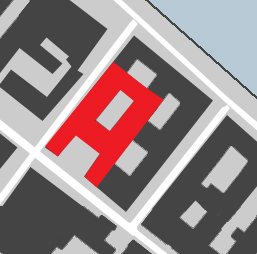 Instead, the main street frontage is a solid building with a portal into the interior courtyard (seen in the bottom left image above, right-hand side of the U on the map). 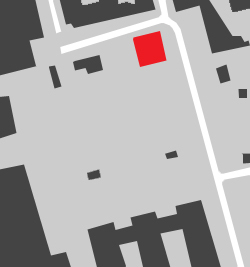 Only once you've walked through the portal into the courtyard is the main house revealed (bottom right image above, left-hand side of the U on the map). The house looks much like it did when it was built almost 400 years ago, the main difference being that the impressive formal gardens to the side of the courtyard have long since vanished. I like how the portal gate splits into two uneven halves when opened. 10) Oxenstiernska Palace, 1650. Gamla Stan. Architect: Jean de la Vallée. Built by a Count who was also the Lord High Chancellor of Sweden. This building was originally intended as a wing of a much larger palace, but the owner and his heir both died before the rest of the palace could be built. Even though the original, more extensive plans were never carried out, this palace is an impressive example of the simplified classicism that Jean, son of Simon, practiced. This building is also impressively preserved; all of the delicate sandstone decoration except for the small pediments remain, and even the ruddy plaster color is original. The vertical rhythm of windows on this facade is interesting and makes me wonder how the space is vertically divided inside the building. Are the small windows indicative of short, "service" floors between main living floors? 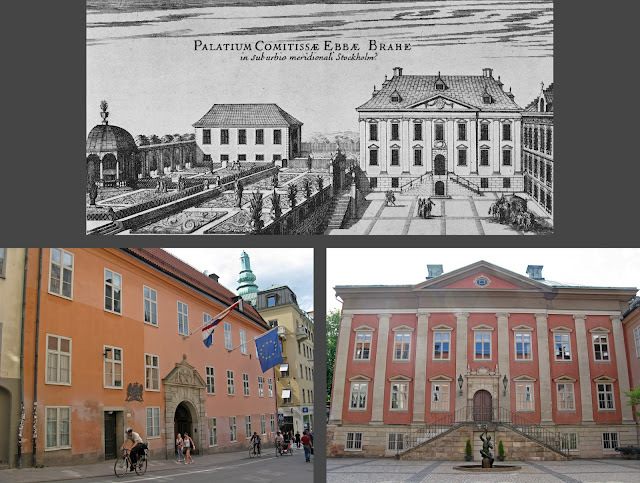 11) Flemingska Palace, 1650. Gamla Stan. Architect contested: either Nicodemus Tessin the Elder or Jean de la Vallée. Built by a Nobleman and a Privy Council Member. 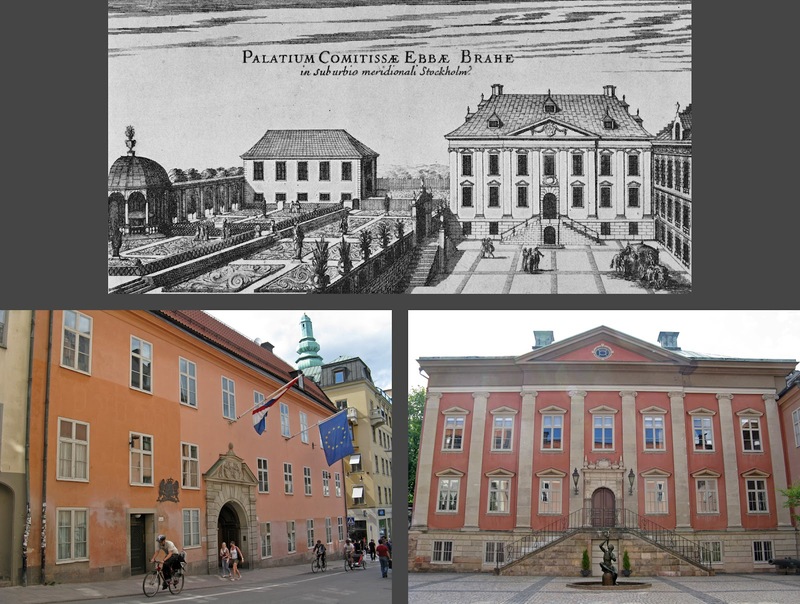 Regardless of who designed the building, the Flemingska Palace with its rusticated base, pilasters, arched openings, and expressed attic band is a great example of the simplified classical style that became popular in the mid-17th century. The exterior of the building has not significantly changed since it was built. 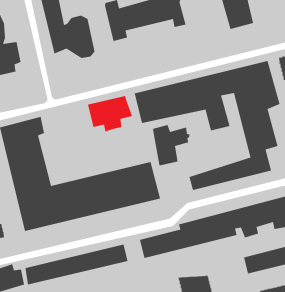 Unlike many contemporary palaces, this building encloses no courtyards or gardens. 12) Wrangleska Palace, 1650. Riddarholmen. Architect: Nicodemus Tessin the Elder. Built by a Count and Military Commander. I briefly wrote about this palace in a previous post. A palace had been on this site for at least 100 years when Tessin added on, but he left the already-ancient towers on the water side of the palace (round bulbs on the left-hand side of the map). The "then and now" images above show how radically the palace was simplified in the 1800's when it was renovated after a fire. 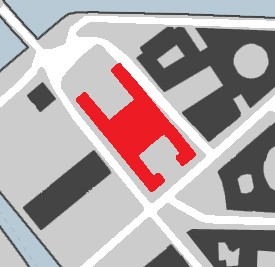 The "then" image above shows that an garden was encased by the house, the towers, and a wall on the water side of the building. 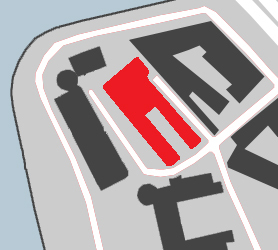 Like the Sparreska Palace, the "front" of the building shifted from the water side to the church square side during renovations. The original, round towers are still visible on the water side of the palace. 13) Schering Rosenhanes Palace, 1650. Riddarholmen. Architects: Nichodemus Tessin the Elder and Jean de la Vallée. Built by a Baron and Privy Council Member. Only the white, middle portion of the building is from Tessin's time; the yellow wings were added during the 1800's. However, even before the wings were added, the palace adhered to the popular tripartite Palladian plan. Originally the U-shape and enclosed garden faced out toward the water. 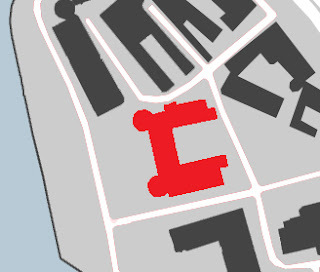 In the 1800's, however, the U was inverted and the skinny courtyard now faces the interior of the island. 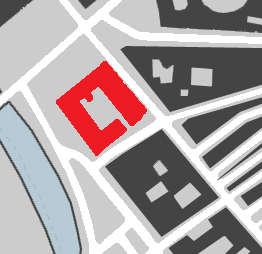 The left-hand image above shows the original building and garden from the water side. The middle image shows today's thin courtyard with the yellow, 19th century wings and the white, 17th century house. Finally, the right-hand image shows today's building from the water side. 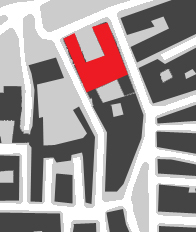 Comparing the left-hand and right-hand images shows that the main, central part of the building has not changed much over the centuries. The 19th century wings are so close together that you have to be in the courtyard before you can see the original building. Interestingly, these wings have different window shapes, rhythms, floor delineations, and roof types. 14) Bondeska Palace, 1662-1667. Gamla Stan. Architects: Nicodemus Tessin the Elder and Jean De la Vallée. Built by the Lord High Treasurer. 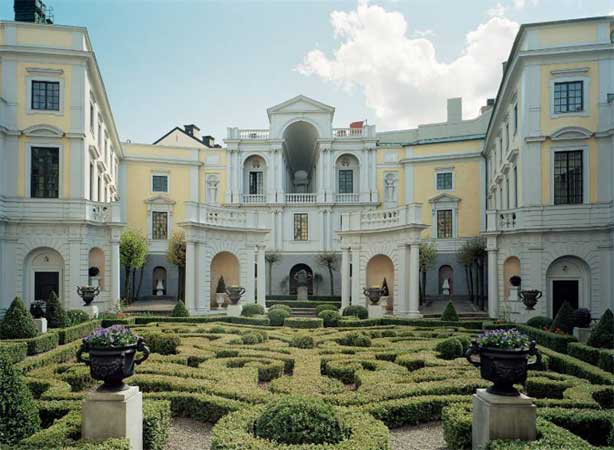 The Bondeska Palace takes Palladio's U-shaped plan to the extreme: the palace's lake-side location is perfect for an H-shaped plan with one courtyard garden facing the water and the other facing the interior of the island. Although a fire destroyed the original, high-pitched roof, this palace looks much the way it was originally designed. 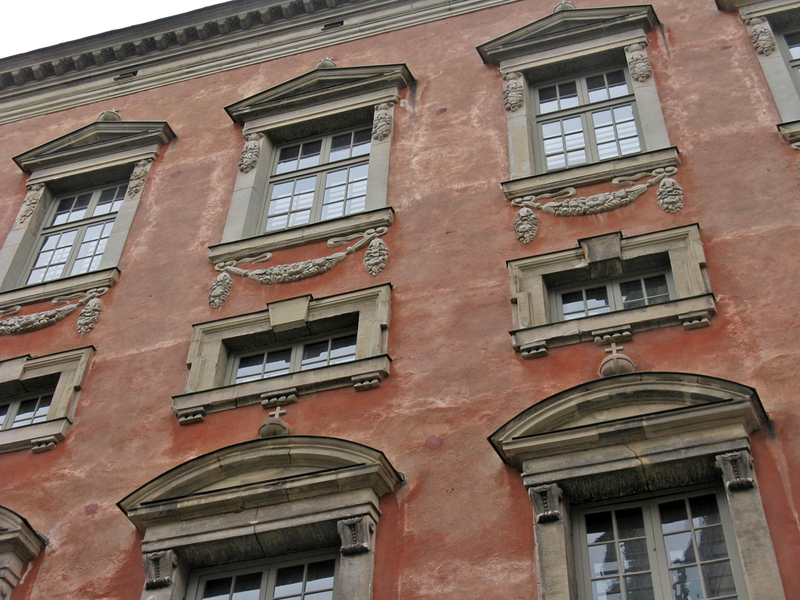 The facades are quite decorative in comparison to many of the contemporary palaces, which was befitting of one of Sweden's wealthiest and most powerful nobles. While quite decorative, the facades are actually fairly subdued due to the nearly all-white color scheme. The decorations are gray on a white, plastered surface. Even the pilasters are white, with only a slight protrusion and "rusticated" incisions in the plaster to indicate the change in plane between wall and pilaster. The above photos show the palace from the island side. The palace as seen from the west, the water side. 15) Bååtska Palace, 1660’s. 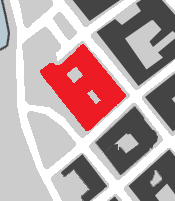 Blasieholmen (Norrmalm). Architect: Nicodemus Tessin the Elder. Built by the Lord High Treasurer. By the 1660's, the simple, classical palace was a well-established pattern with a central building; two flanking wings; simple plaster surfaces with a rusticated base; pilasters; simple ornamentation at the windows, capitals, and level indicators; and a slightly more decorated central pediment on the main building. 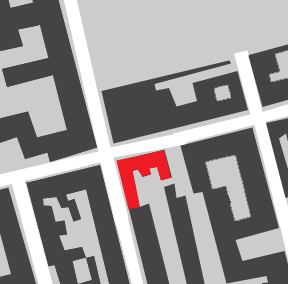 Bååtska Palace follows this pattern to a T. I find it sad that the courtyard is now a parking lot. 16) Lillienhoffska Palace, 1660’s. Södermalm. Architect: Johan Tobias Albinus from The Netherlands. Built by a wealthy merchant who was later knighted. Comparing the map for Lillienhoffska Palace to most of the other palaces, one can see that this palace is much, much smaller in scale than its contemporaries. This makes sense considering that it was built by a merchant instead of a noble. While quite wealthy, the merchant wouldn't have had nearly the level of resources as a Swedish noble, even if he was knighted. Although this palace's ornamentation is quite similar to that of many other palaces, the decorative elements feel bulky and a bit awkward. 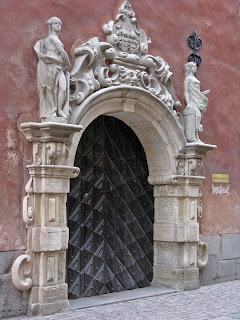 17) The Hornska House (Reenstierna), 1660’s. Södermalm. Architect: Johan Tobias Albinus from The Netherlands. Built by a wealthy merchant who was later knighted. The Hornska House is similar in style and scale to the Lillienhoffska Palace. The builders of the two palaces were in much the same circumstances: successful, wealthy merchants whose success lead to knighthood. The proportions and ornamentation of this palace is a much more successful example of Albinus' work than at Lillienhoffska. 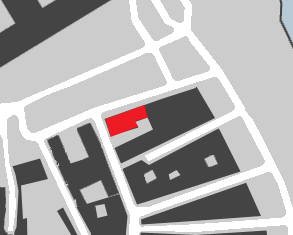 18) Van Der Nootska Palace, 1670’s. Södermalm. Architect: Mathias Spihler (son-in-law of Jean de la Vallée). Built by a Military Officer who was married to a Swedish noblewoman. Looking at the "then and now" images above, it is obvious that not much has changed on the Nootska facade except for the addition of attic dormers and a less intrusive roof. The ornamentation at the central entry is original and well preserved. I find the surrounding context in the "then" image quite interesting: the area surrounding this palace is obviously not a very fashionable neighborhood. Originally, a garden was enclosed by the two side wings. 19) Boneaus Palace, 1675. Gamla Stan. Architect unknown. Built by a wealthy business man. Not much is known about this palace's origins except that the third floor and the attic were not original. The original level of the roof is indicated by the remaining heavy band above the third floor windows. 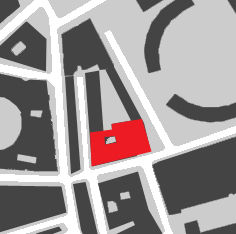 Like so many palaces built in the 1600's, this one has a main building flanked by two wings that create a protected courtyard. 20) Tessins Palats, 1690. Gamla Stan. Architect: Nicodemus Tessin the Younger. Built by the architect for himself. If only architects today could afford such scrumptious, grand houses across the street from the royal palace! Tessin built this house for himself, and one can only assume that what he built for himself contains the style and types of ornament that he himself preferred. If this is the case, Tessin's taste was a bit more restrained than that of his clients. 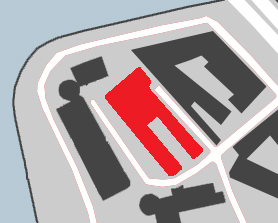 The "then" image above shows that while the palace did not have wings on the front side of the house, it did have wing walls which simulated a protected courtyard space. However, this courtyard space was not used as a garden; this function was reserved for the ornate gardens behind the house. What a hidden gem in the middle of dense, urban Gamla Stan! Wow! Given the simplicity and flatness of the front facade, you would never guess what intricate plantings and three-dimensional Baroque facades await you behind the house. Tessin was a master at tricking the eye: the temple at the back of the garden looks like it's about 20 or 30 feet deep, but in fact, it's only about six feet deep. 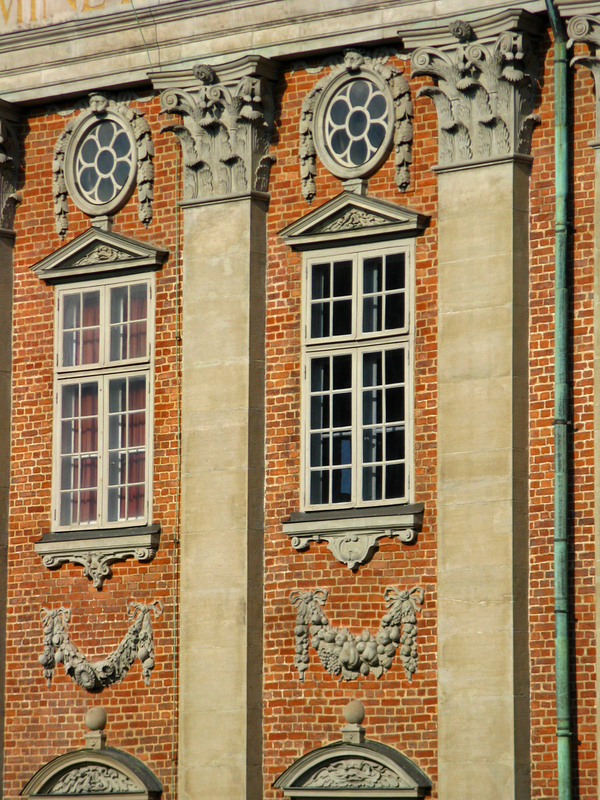 Details from the front ornamentation. I am amused to see one of the angels (above the main door) drawing with a pen in hand. 21) Piperska Palace, 1692. Gamla Stan. Architect: Nicodemus Tessin the Younger. Built by a Count who was also the King's confidant and state minister. Today, this palace has a sad view toward the ugly, above-ground 1950's subway station and a tangle of rail tracks and roads. 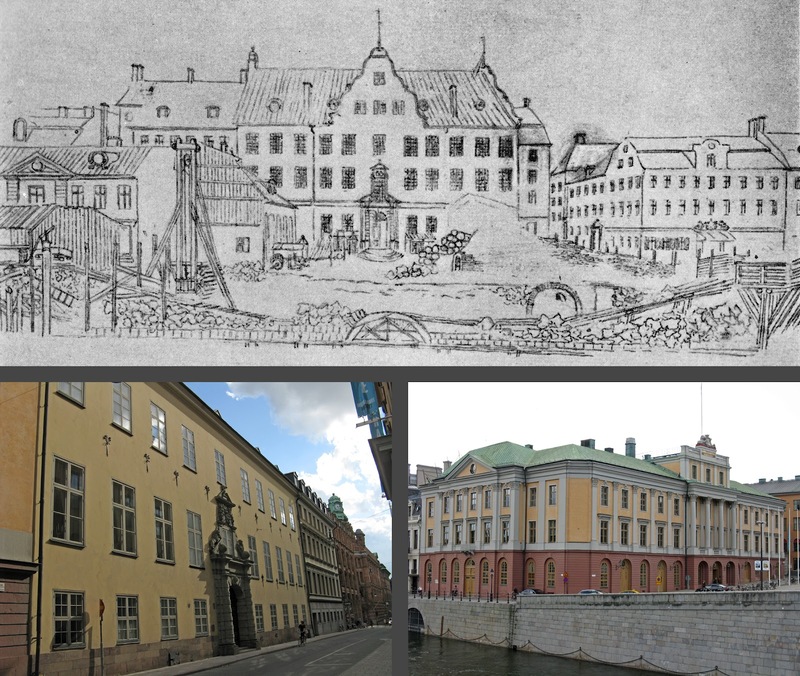 When it was built, however, the courtyard would have faced a wonderful water view with the Riddarholm Church and Riddarholm palaces in the background. I have not found much information about this building except for the date and architect, but the style and form is much in keeping with the times. Interestingly, however, the facade is a bit more Baroque and three-dimensional than normal with the ever-so-slightly projecting central portion of the main house around the main entrance. 22) Schefflerska Palace (Spökslottet), 1699. Norrmalm. Architect unknown. Built by a wealthy merchant. 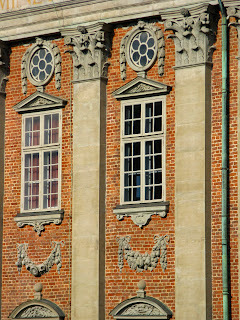 While Schefflerska Palace's ornamentation is extremely simple, the form of the palace is quite complex. When scrolling through all the images of all 22 palaces from the 1600's, it becomes evident that over the century, architects' focus and attention turned from ornamentation to massing. 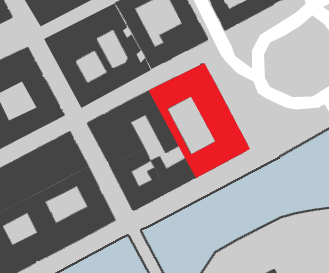 The central portion of the main, central building is very slightly projected in the Louis de Geers, Schering Rosenhanes, Bondeska, Bååtska, and Piperska Palaces, but these projections are about six inches at most. 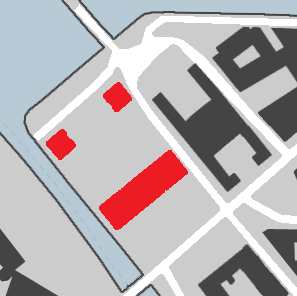 At Schefflerska, however, the central projection is around three feet. 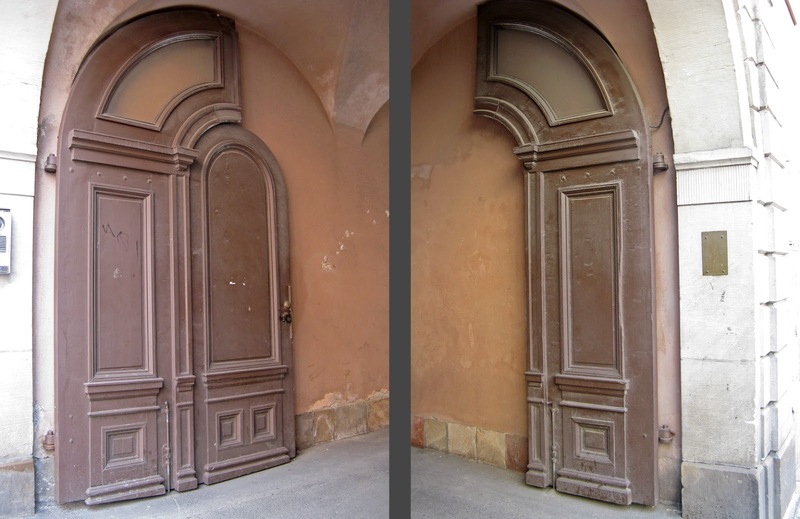 Not only is Schefflerska Pallace's front elevation (above left image) more three-dimensional, but the back elevation (above right image) is much more three-dimensionally complex as well. 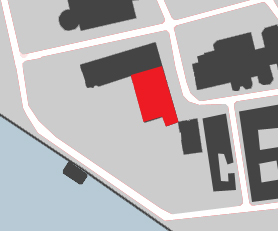 The main, central building extends outward farther than the wings (see map above), and the back entry is a one-story pavilion which projects out from a central two-story projection that juts out about eight or nine feet from the main surface of the facade. The only 17th century palace that exceeds Schefflerska's three-dimensional complexity is Tessin's own palace. 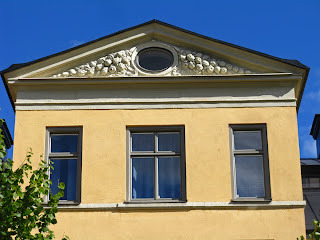 Detail of the fruit ornamentation in the pediment in the protruding mass at the main entry. After the 17th century, Stockholm’s building boom abruptly halted and very few palaces were built. There are two reasons for this, the first of which was a Parliament act called the Reduction of 1686. The Reduction demanded that all baronies would be returned to the Crown. All land outside of Sweden that the kings had previously granted to the nobility as gifts were also returned to the Crown. The king was given the right to “borrow” and to “take, if necessary” any noble land inside of Sweden that was needed to finance the military. Additionally, the nobility was no longer exempted from the payment of taxes. This attack on the nobility benefited both the king and the merchant, for never again would Sweden’s nobility have the power or the money to dominate politics or commerce. After the 1680’s, Sweden effectively became a country dominated by the middle class, and this is still the case today. The second reason for the drastic halt in Stockholm’s development was the crushing defeat of Sweden’s military by Russia’s Peter the Great in 1709. Money stopped flowing into the capitol, and residents, even the merchant class, stopped building. Phew! It feels good to be finished with this enormous post. I have been working on researching and photographing it off-and-on for almost six months now. My school workload, vacations, visitors, apartment decorating, and general life as well as the sheer density of this post have all conspired to draw out the process. Luckily, the next couple of posts are much more limited in scope so I should be able to research, write, and post them soon! All palace maps are to the same scale. North is up for all maps. Unless otherwise noted, all “then” drawings came from Stormaktstidens privatpalats i Stockholm by Martin Arvid Ohlsson (1951). Unless otherwise noted, all "now" and detail images are my own.